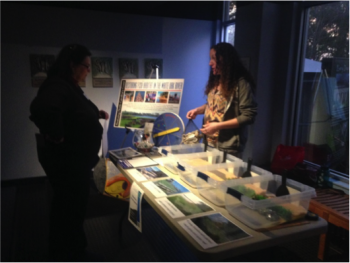 Coastal Fellow, Kristen Daly, describes the lesson to an educator at the local SciREN event in Pine Knoll Shores. While rotating through the stations, students simulate wave energy and observe which method works best to protect estuarine shores. Though the activity is adaptable to use with various ages, it is designed specifically for 4th grade, and meets NC Essential and Common Core Curriculum standards for that grade level. Teachers can contact our central education coordinator, Rachel Bisesi, at rachelb@nccoast.org or (252) 393-8185 to check out the lesson materials or use the lesson plan to create the shorelines on their own.